This page displays the information available for the Crumar-Nerve Centre 50 (Sphere item # 7529). Description PRICE REDUCED AGAIN! Interesting rhythm box / orchestrator, in pretty good but not perfect cosmetic and working condition. Without a manual it's difficult to tell for sure, but the way the auto-accompaniment works seems erratic at times. Some pots are noisy from lack of use, and the two switches on the back are stiff. The Cymbal knob doesn't seem to make any difference. Everything is generally in good condition, looking smart, except that there is some sort of grommet missing from the pedal box, so the multi-core wires are exposed. 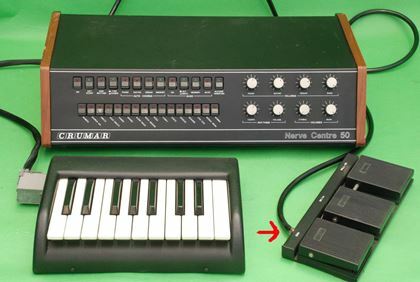 Includes three pedals, with On, Major/Minor and Fill switches; a neat 18-note keyboard; and the main 'nerve centre', with some nice cheesy rhythms, easily turned into something weird by slowing down the tempo or deliberately playing something that doesn't fit the genre. Packing at VEMIA 10GBP. Standard IEC lead - UK or European can be supplied if required.